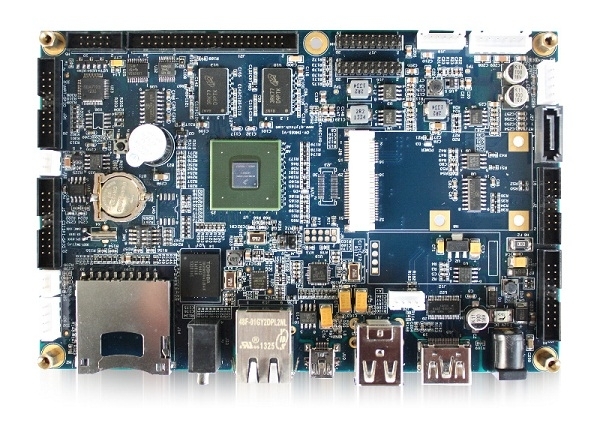 This robust industrial grade single board computer is based on the power efficient Freescale NXP Cortex™-A9 I.MX 6 Series processor available in single core, dual core or quad core configurations. The board is ideal for a wide range of industrial applications including data acquisition systems, industrial automation controllers, automotive & telematics applications, kiosks, IoT, Smart appliances and medical equipment. Out-of-the box, the board supports a number of interfaces that allow for high flexibility in integrating the unit with other boards or controllers. These include 5 USB2.0 ports, 1x USB(OTG), 12x RS-232,1x RS485/232, 1x I2C, 1x SPI, 1x SATAII, 1x Micro SD, 1x Mini PCIe, 2x Ethernet port, 1x onboard WiFi, a 40-bit digital GPIO and dual CAN bus for automotive applications.. In addition, the board supports both Android and Linux OS natively out of the onboard 4GB iNAND flash. The optional development kit comes with either a 7 inch or 9.7 Capacitive 1024x600 Touchscreens and is intended for development of applications and drivers. Please allow for 2 weeks for shipping of the unit. For customization, manufacturing and volume/wholesale discounts please email support@geekland.co or call us at (877) 597-7673.